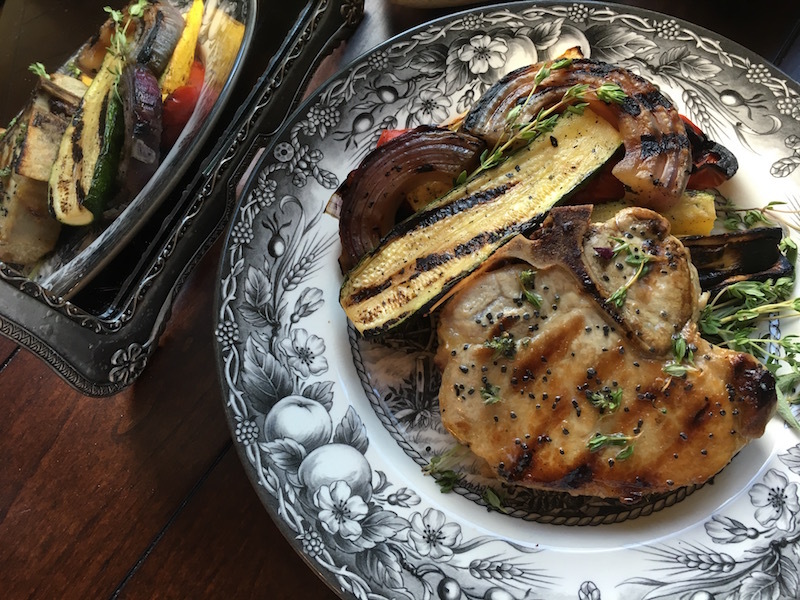 Grilling pork chops is an entirely different experience than grilling red meat. While steaks can be charred on the outside and a delicious shade of pink inside, pork needs to be more uniformly cooked throughout. Therefore, use a medium direct heat while grilling pork so the inside cooks evenly with the outside. Keep in mind when assembling the ingredients for the herb rub that it is more of a template than a hard-and-fast rule. We aren’t going for dainty precision with this technique, just a uniform infusion of robust herbal flavors. Combine salt, basil, rosemary, thyme, garlic and pepper thoroughly in a small bowl. Rub mixture over all sides of pork chops until thoroughly covered. Scrub grill grates with a wire brush prior to starting. Preheat grill to medium before adding pork chops over direct heat. Cook for 7-8 minutes, turn once, but otherwise keep the lid closed as much as possible. If your chops are thinner or thicker than 1”, adjust cook time accordingly. Remove chops from heat, cover and let rest for 3 – 5 minutes before serving. Serve with a grilled summer vegetable medley and top with a pat of compound butter seasoned with the same herbs used in the rub.